If you are going to brave the greens despite the rain, you’re going to need golf cart windshield parts that can withstand the weather. There’s nothing worse than being caught riding a golf cart, that is unable to keep you sufficiently dry, clean, and maintain visibility. Accidents caused by poor visibility, ineffective windshields, and wipers, or not maintaining your cart’s windshield can spoil the game. You want to focus on making a birdie, not hitting the brakes because of standard quality windshield and wipers. You don’t have to stress over choosing parts for a golf cart windshield wiper installation, or how to clean a golf cart windshield. This post has some suggestions for you, so you’ll be able to feel more comfortable with installing a windshield and wiper on your own, as well as managing upkeep. When you look over a standard golf cart, you may not think much of the windshield. However, this simple structure built into most golf carts protects riders from flying bugs, oncoming rain, and provides a minimal layer of protection against the elements. Remember that you get what you pay for, so if you are ready to improve your golf game, you should invest in a quality windshield for your golf cart. You want a windshield that is durable can withstand impact from stray golf balls, and look good on your cart. If you want to get a windshield and wiper set for a street-legal vehicle, such as a bumper car, you are going to need a windshield that is not hinged and completely flat. There is a range of windshields that are made just for street vehicles that offer UV protection, tinting, and scratch resistant treatments. Many windshields for golf carts are developed for scratch resistance, reducing glare, and may have a hinge. Depending on the construction material for a windshield, and additional chemical treatments during processing, you will get varying results. Think about your options for golf cart windshield parts carefully before making a final decision. Acrylic, also known as Plexiglass is a hard surface that is inexpensive and naturally has scratch resistance. However, this material can easily shatter if struck by a golf ball or other object. Using acrylic modified with an additional layer of plastic makes the windshield more resistant to shattering if struck. However, objects that manage to collide with modified acrylic may still suffer a crack or some damage. This is a middle-of-the-road option for many golfers. A pricey option indeed, but polycarbonate windshields that have a layer of scratch resistance have many benefits. Typically available in a tint or translucent, these flat panels will protect your cart or another low-speed electric vehicle from unwanted damages. If you want to outfit a windshield that can withstand impact from solid hard objects, you might want to go with polycarbonate. If a golf ball manages to strike a windshield made from this material, there is enough malleability to absorb the hit, and not end up cracking or breaking. The only drawback with polycarbonate is that because it is relatively soft, it is not very scratch resistant. The utmost care should be used when cleaning a polycarbonate windshield to prevent damage. Price does influence how durable and capable your windshield is of taking an impact without significant cosmetic or structural damage. Acrylic is the most inexpensive option commonly available, and polycarbonate is on the luxury end of the scale. Thick windshields will be more expensive and can withstand more problems. Consider your budget, choice of vendor, and your needs before purchasing. Also, depending on the type of material and its treatment during processing, you will need to be careful about how you clean your windshield. Windshields that are not routinely cleaned and serviced could end up looking shoddy, suffer from loose hinges, or have unwanted scratches and a foggy appearance. Learn the best way to take care of your windshield for visibility and keeping an excellent presentation. When selecting golf cart windshield parts, you are investing in your golf cart’s form and function. Choosing a brand and vendor with reasonably priced parts that are easy to install makes things painless, and improves the look and feel of your golf cart. You should choose a vendor that uses authentic brands so that you can have warranty protection and quality control assurance with the product choice. Two brands that are good for any newbie or a pro looking to improve their golf cart are Star and Ezgo. 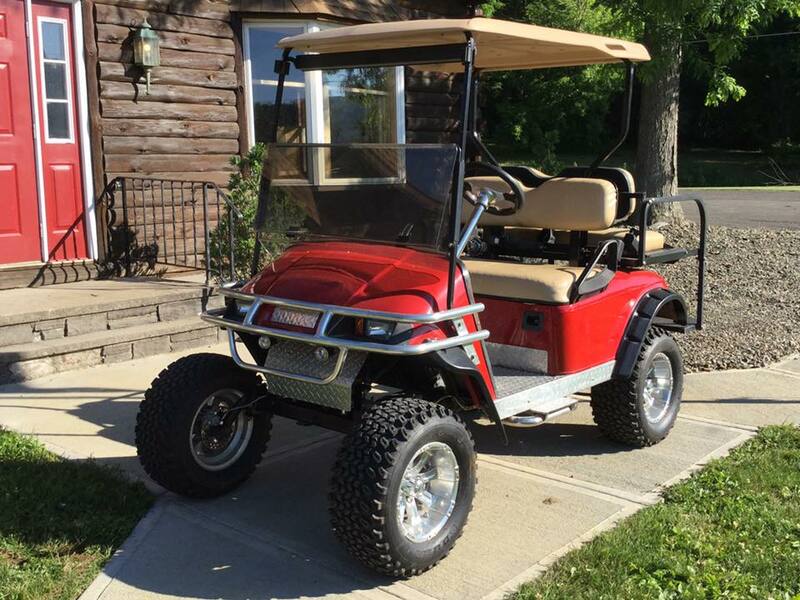 You can find an EZ–golf cart windshield with polyurethane hinges and a protective film. Most of their windshields will have a standard thickness of 3/16″ or more. The quality of the acrylic chosen for their windshields will give you long-lasting visibility and longevity on your golf cart. 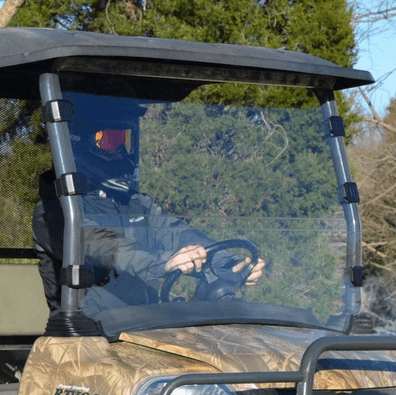 You won’t have to struggle to find any necessary mounting hardware, and let golfers fold the windshield down easily for ventilation and comfort. Another choice worth considering is a star golf cart windshield. Star EV has been producing quality parts and accessories for various types of vehicles, and golf cart windshields are just another great product they readily provide. You can find windshields that are approved for street-legal vehicles, tinted, or hinged for customizing your golf cart. When you get a windshield kit from Star, you’ll have everything you need for a seamless installation. Windshields that are lightly tinted help reduce any unwanted glare from hurting the eyes. A hinged windshield allows riders to flip it down, adjusting for temperature, wind, or rain. Various treatments to the windshield ensure that it is resistant to fading, shattering, or cracking. Make sure that the windshield you choose is a match for the model of the golf cart that you have. Depending on specifications, the windshield might not be the right fit, or there may be gaps that need filling. Choosing the right windshield parts for your cart can make all the difference in your golf game. You’ll appreciate a windshield that can fold down on days that are extremely hot and sticky, or during colder days when it’s steadily raining. Older golf cart models may have windshields that have a gap, so the wind and the cold can make passengers inside a bit uncomfortable. Instead of using a foam noodle to fill in any gaps, you can purchase a wind seal to block unwanted air and cold from coming into your golf cart. 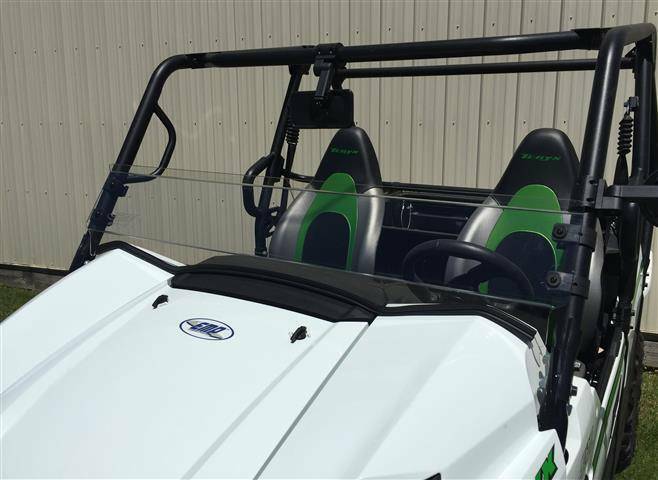 When selecting a new windshield for a golf cart, or upgrading a windshield, keep the front cowl, gaps, and functionality in mind. After investing in the perfect golf cart windshield parts, you want to make sure to maintain them well. When cleaning your windshield, you want to avoid using robust solutions with substances like ammonia to clean, as it can degrade the quality of the plastic. Paper towels should not be used either, as it can cause scratches and make your windshield look dull. You want to carefully clean your windshield with a reasonable amount of mild soap and rinse it clean with water. It is best to use a soft towel or cloth that will not scratch the windshield easily, pat the plastic dry, and do not be too rough on it. Insect spray should not be sprayed onto your golf cart windshield, because it can cause it to dull and lose its clarity. Once you put your windshield and wiper parts into place, consider using a windshield protectant to keep your golf cart look its best. There are polishes specially formulated just for golf cart windshields, which can help reduce and remove any light scratches on the plastic, which can reduce visibility. Things like the hinge on windshields can eventually give out after enough wear and tear. Be prepared to have to replace the hinge, which is available at most nearby hardware stores. A degraded hinge does not mean you have to run out and purchase a brand new windshield if you don’t absolutely have to. Consider investing in some golf cart windshield clips. These are handy for helping keep the windshield in an upright position and will need to be replaced once they become loose and cause rattling. Proper maintenance of your golf cart windshield and wiper parts will add to the longevity and performance of your vehicle. 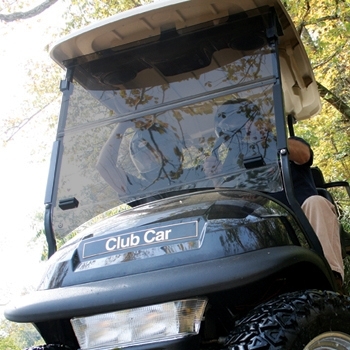 Treat your golf cart with care, routine maintenance, and you’ll have many enjoyable rides in your golf cart. Upgrading the windshield of your golf cart is one of the simplest ways to stay comfortable year-round while golfing. And it gives your golf cart the look and customized touch it deserves.